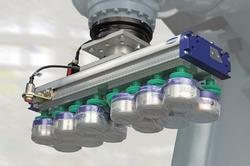 Vacuum gripping systems from Schmalz are used in a wide variety of industries to ensure efficient process automation. Our range of solutions stretches from flexible, easy integrate universal grippers to complex, custom-designed system solutions. The area grippers FX/FM feature an impressive compact size and low weight. They are ideal for use in packaging machines such as case packers. The grippers are available with an integrated vacuum generator (FX) and a connection piece for external vacuum generation (FM). 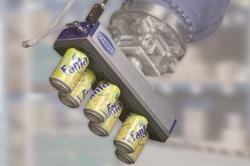 The Vacuum Gripping Systems FXP and FMP guarantee maximum flexibility during automated handling processes. This universal gripper makes automated palletizing, depalletizing, order picking and sorting of the most varied goods in varying dimensions with only one gripper possible. Workpieces made from the most varied materials, such as carton, wood, metal sheets (dry) and plastic, both with and without cut-outs, can be handled. Also, porous workpieces, workpieces with gaps and workpieces with an undefined pick-up position can be handled. 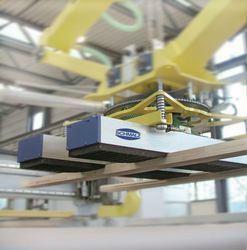 Together with capable palletizing robots and gantries, vacuum layer gripping systems from Schmalz increase the production output in the automated handling of products in various industries. Individually planned systems guarantee an optimal process integration and ensure a quick return on Investment. Looking for Vacuum Gripping Systems ?